In the run-up to the UN Security Council vote on the renewal of the MINURSO mandate at the end of this month, we are asking you, our partners and supporters, to work with us to contact members of the United Nations Security Council. Following a letter from the European Union's External Action Service (EEAS) to the Western Sahara Campaign UK in January this year, inviting us to a meeting, we replied asking for more information. The communication is in relation to the EEAS's supposed aim to consult our organisation in reference to seeking the permission of the Saharawi people regarding future EU-Morocco trade and fisheries agreements. We never received a reply, or even the courtesy of an acknowledgement, to our second letter. Despite this the WSC is included in the list of organisations that engaged in consultation. Below are the letters from the EEAS and our replies. The Western Sahara Campaign welcomes the judgement of the European Court on our case that the High Court referred to the European Court on 27 April 2016. The Court have ruled that the EU-Morocco fish deal is illegal if Western Sahara is included. Progress towards a political solution to the conflict in Western Sahara remains deadlocked. For the Saharawi, the day-to-day grim reality of stalemate persists. All continue to be denied the right to self-determination which the UN ceasefire agreement promised them some 26 years ago. We need supporters to write to their local MP in the UK to urge the UK government to take the lead in the UN Security Council in the run-up to the MINURSO vote in April to include a human rights monitoring mandate for the mission. The Western Sahara Campaign welcomes the opinion of the Advocate-General of Wednesday 10 January on our case that the UK Courts referred to the European Court in early 2016. As the concluding paragraph notes: the Fisheries Partnership Agreement between the European Community and the Kingdom of Morocco, including fishing opportunities and financial contribution, are invalid. 29.10 - 2015What were you doing on 7 November 1975? The Western Sahara Campaign works in solidarity with the Saharawi people to generate political support in order to advance their right to self-determination and to promote their human rights. Our role is to lobby the UK Government and the EU. You can help us to ensure the UK does not ignore the voice of the Saharawi people. 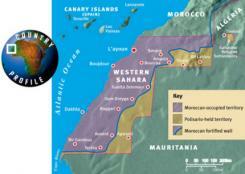 The EU pays Morocco to fish in occupied Western Sahara.